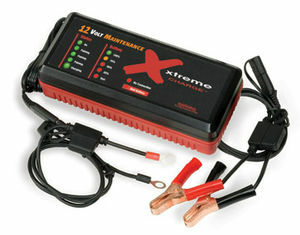 Xtreme Charge 5-stage Pulse Maintenance Charger works with any 12-volt lead-acid battery including flooded, fill and charge, gel, AGM and all maintenance-free varieties. Whether your battery is new or old, our Patented Pulse Technology in our chargers minimize the size of lead sulfate crystals to ensure that it keeps as much charge as possible. It doesn't matter if you're using a traditional or a high-performance battery – our proprietary charging algorithm will find the proper charge for maximum power. Just plug it in to any 110-220 ac power source, turn it on and it will recharge the battery quickly and safely. It's fuse-protected, spark-proof and is UL Certified for both indoor and outdoor use, making it the ultimate 12-volt battery charger!